As far as Keith Southon is concerned, when he goes fishing there’s only one way to fly. 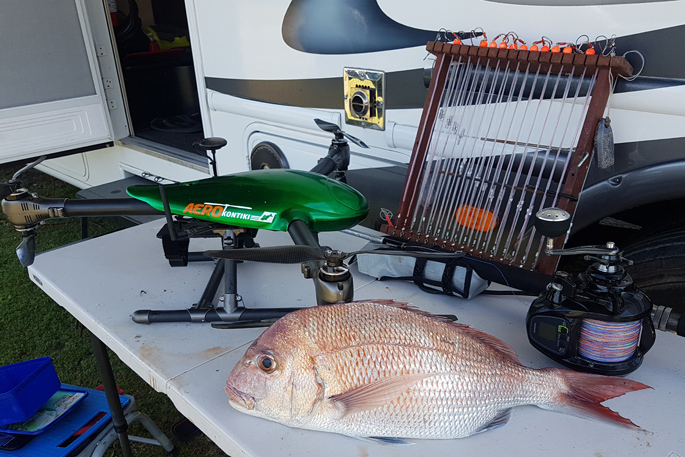 He fishes from the Bay of Plenty up to the top of Northland with his AeroKontiki, a New Zealand-designed and produced fishing drone, and he’s a convert. “It’s my only device that I use for fishing. And it’s a hugely successful way to go out to longline fish. “There’s been many different configurations of how you get your line out to where the fish are. This is just the simplest and the quickest. “We can launch a line of up to 25 hooks out to a kilometre in about four minutes flight time. It’s about five minutes to set up, bait up, organize the launching board, and then we’ll fly. Apart from the AeroKontiki’s user-friendliness, and the numbers of fish he’s harvesting, which are rapidly filling the freezers of friends and family, it’s the intelligent safety philosophy of the AeroKontiki that most impresses Keith. “There’s a heap of safety built into it. If it’s losing height, if it’s pulling too much weight, if the batteries get too low, it will automatically release the line and take over to bring itself back. “If you fly more than 30m from your base unit, it will not drop below 15m. “So, you can’t reduce the revs on the drone to drop it into the water when it’s out at sea. It’s not only very effective, it’s a fun device – with ‘cool factor’ as one of Keith’s friends once put it - to play with. And incredibly well thought-out by a company that cares about its product and is very responsive to its customers, he says.